The Visitor’s center sits high up on Kaysinger Bluff overlooking the dam. The view from the huge glass front is nothing short of breathtaking! 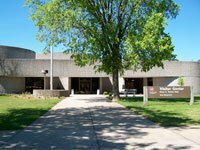 The center is also host to some of Benton County’s richest history including replica’s of ancient mastodon bones found in a dig South of Warsaw before the reservoir was filled.